The Sunshine Socialist Cinema is an outdoor cinema powered by solarpanels, run by artists Kalle Brolin and Kristina Müntzing. We’re re-distributing surplus light from day to night by solarpanel and projector, and screen films that generate discussion on radical leftwing topics. Our themes include post-industrial survival, political filmmaking, artists joining political collectives, and more. Our activities include public screenings, studygroup discussions, field trips, and presentations hosted by other institutions. If you want to receive up-to-date emails about our activities, sign up here (Swedish) or here (English). The cinema is installed in a garden in Höja in the southern Swedish countryside, with screenings occurring regularly during the summer months. A 230 W solarpanel provides power for a 270 W projector, meaning two hours of sunlight gives us one and a half hour of projected film at night. Screen and bleachers purposebuilt, free entrance, artworks on display, and connections developed gradually with local organizations. Programming is discussed and technical issues worked out in a study group run within the local workers educational association, ABF, where we’re also figuring out a typology of political film and filmmaking. 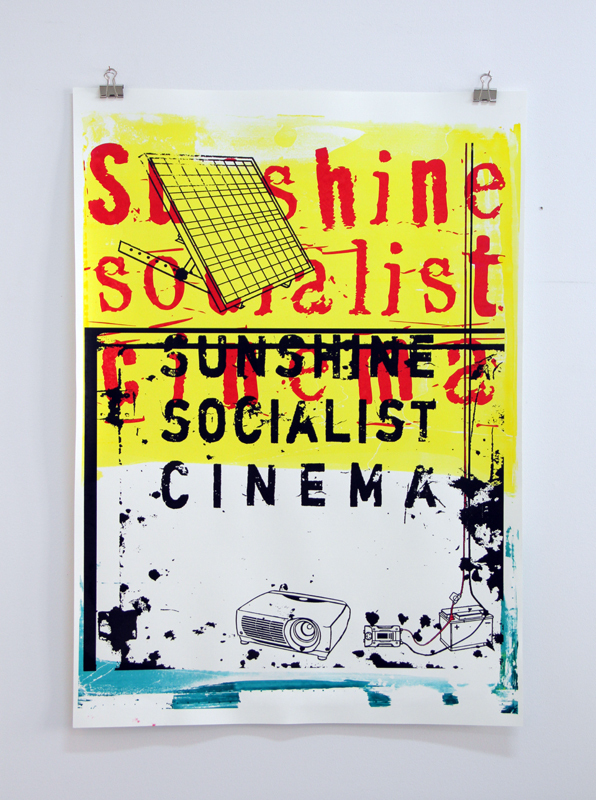 The Sunshine Socialist Cinema is set up in a garden in the southern Swedish countryside during the summer months. If you’re going by car, take the E6 motorway to the northwest corner of Skåne/Scania, look for the exit marked Höja. Follow the long straight road east across the fields for two minutes until you reach the small village Höja, where you park by the church, then walk back 50 meters along the road you just came. If you’re going by train, you get off at Ängelholm station, then follow Järnvägsgatan east (across bridges, through the city centre, under the motorway), and just stay on this road until you reach Höja. The road changes names a couple of times but it’s the same one all the way. There’s a new bike path that goes all the way out to Höja; going by bike from the train station takes 20 minutes. Walking takes about 50 minutes-1 hour. If you want to check a map, the postal adress is Höja landsväg 293, 26293 Ängelholm. Where in the world is this cinema?? I assume it’s somewhere in Sweden??? Hi Madeleine – it will pop up in various places but by the end of July we’re premiering in the countryside of northwest Skåne. A detailed description on how to get here will be posted together with the program once all the technicalities and construction work is taken care of. Any day now, actually. We’ll be sure to let you know! Hey Istanbul! We lived in Beyoglu for a couple of months in 2009. Love your city, but we are so out of touch these days… Thank you for the post! !